Glass curtain walls are lightweight aluminum-framed facades housing glass or metal panels. These glazing systems don’t support the weight of a roof or floor. Instead, gravity loads and wind resistance transfer from the surface to the building’s floor line. 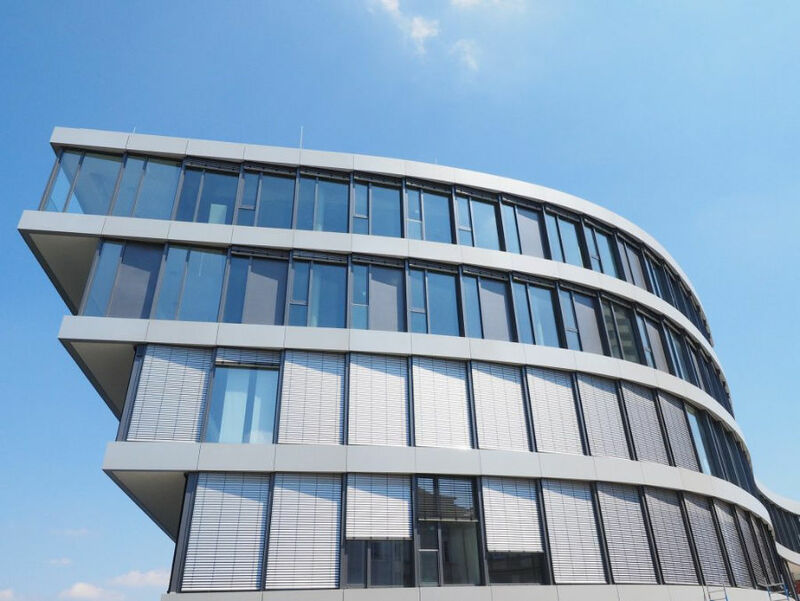 Curtain walls are often part of a building envelope or comprises one part of a wall system. Each glazing system requires careful integration with other adjacent structural elements such as wall claddings, roofs, and wall details. Curtain wall systems range from standard prefabricated systems to specialized custom wall units. Increased costs often come with additional customization and larger sizing. These aluminum framed glass wall systems are a hallmark of modern architecture, dating back to the 1930’s. Increases in the availability of inexpensive bulk aluminum following WWII led to their popularity and wide-spread adoption. Glass curtain walls are not exclusive to commercial applications. They also provide viable glazing solutions for residences as well. Fabrication and installation methods classify glass curtain walls into two general categories: stick systems and unitized or modular systems. Stick systems, utilize a frame made up of millions and glass or opaque panels. These panels are designed and installed as a unitized system. Unitized systems are composed of large units that are assembled and glazed in the factory. The installer or builder then receives and erects the glass sections on the building site. Each vertical and horizontal mullion in each module mates together with adjoining modules. Typical units are five to six feet wide, while modules range in dimension. The standard size is around one story tall and one module wide; however each section may incorporate multiple modules. Unitized and modular glass curtain wall systems work as both interior and exterior glazing applications. Each offers various advantages and disadvantages. Interior glazed systems allow for glass or opaque panel installation into the curtain wall openings from the interior of the building. These systems typically require specific design per their application. Exterior glazing systems work well for low rise construction projects that allow for easy access to the exterior of the building. Larger high-rise construction projects may require interior glazing. This is due to the logistics of accessing and replacing multiple stories of glass. These systems often require scaffolding or booms to access the exterior of the curtain wall when repairing or replacing components. Some curtain wall systems may be glazed from either the interior or exterior of the building. Pressure-equalized rain screen systems are the best if you need a system to resist air and water infiltration. A gasket surrounds the face of the glass and creates a pressure equalized chamber that forms an airtight barrier. The outside face of the glass and accompanying exterior glazing materials with the aluminum framing create a rain screen and shed water away. These systems also do a fair job of transferring wind loads. Water-managed systems incorporate drains and weeps. These systems are designed to resist water infiltration, but they make no effort to create an air barrier or “zone-glaze”. This means that a larger amount of water is forced into the system and must be weeped away. Since no air barrier exists, the pressure differential between the glazing pocket and the interior may be strong enough to force water vertically higher than interior gaskets. This results in leaks. Face-sealed systems require continuous and perfect seals between each glass unit, it’s frame and between all other frame members. The long-term durability of these seals is minimal. Patching these systems may require glazing tape. The thermal efficiency of a glass curtain wall system depends on the glazing infill panel and the frame construction. Since Aluminum has a high degree of Thermal conductivity it can transfer energy (heat) very rapidly. This results in energy loss. Implementing thermal breaks constructed of non-conductive materials is a common practice that increases energy efficiency. Improving heat efficiency also depends on the use of low-e and spectrally selective glass coatings. High performance coatings can significantly increase insulation and improve comfort for a building’s occupants. With a glazed curtain wall, the challenges is in balancing the desire for more natural daylight versus managing heat loss and gain. Having too much uncontrolled light can also result in glare. The goal is to find the right materials and glazes that will meet a building’s requirements. We work closely with companies and businesses to help determine their commercial window and glass installation needs. 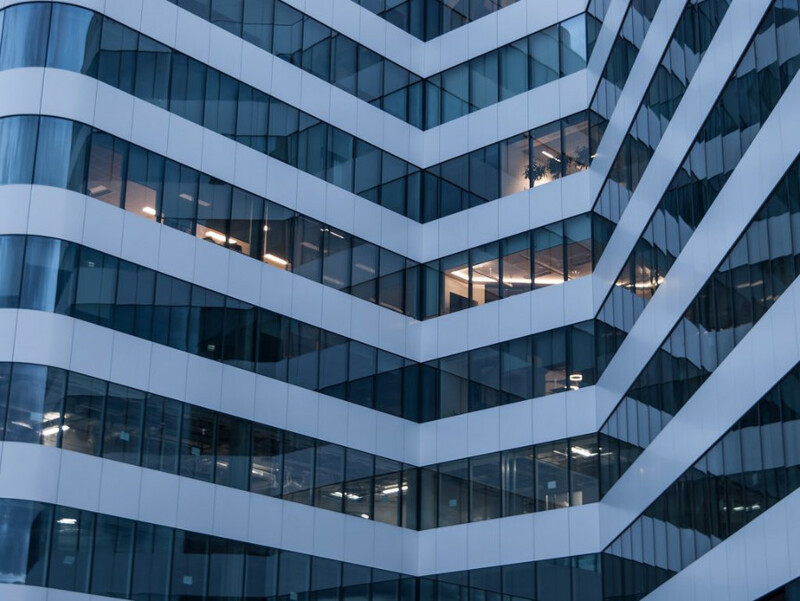 Ultimately we aim to offer you a wide range of commercial glass solutions including: storefront glass, glass curtain walls, and glass partitions. We also handle custom sizing and specifications, with the experience you would expect from industry experts. Contact nvision Glass in Reno or nvision Glass in Las Vegas for more information or for a project estimate.